I had an email on Sunday from Paul Peacock of City Cottage. I don't usually write a post as a result of an email asking for publicity but this was different. It wasn't from someone asking me to mention a product that they wre trying to sell but for something that was freely available on the Internet and so after having a look at what they were offering I decided that I would share the information with you. 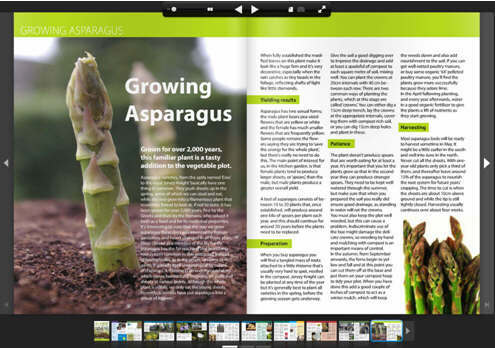 City Cottage publish a freely available online magazine which focuses on self sufficiency. The information that was sent to me was to publicise the second edition of their magazine which can be viewed online or downlaoded to view on a tablet device. You can access it here. Foscussing on self sufficiently the topics covered in the magazine are more diverse than those of purely gardening magzines. I haven't yet read the magazine but first impressions are that it looks to be a very professionally put together publication. See what you thinks. Although we live reasonably close to Harrogate, it's years since we went to the Harrogate Flower Show. We used to regularly visit Gardeners' World Live but then became a bit bored as the shows started to be repetitive and diversified so much that lots of the stands weren't even gardening related. The show gardens at GWL annoyed me as the designs were made up of things that wouldn't usually flower at the same time or thrive long term in the same conditions. Then to top it all they used Sambucus Niger as an edging plnat in a bedding scheme. As this grows into a large bush in its first year, it just all seemed like cheating! I wanted to be inspired by a show garden and be able to do something similar in my own garden not just see a picture painted with plants. Something that couldn't be replicated in a real garden. Anyway this year we decided to buy tickets for Harrogate and chose to visit on the first day Thursday. As it turned out Thursday wasn't the ideal day weather wise for a Flower Show and if we hadn't bought tickets we probably would have decided to stay at home and wait to see whether Friday was a better option. (As Friday was drier it would probably have been a good move but then again maybe it would have been busier). The car was parked in a muddy field but fortunately we had our walking boots to prevent soggy feet. I noticed others hadn't! Buses were laid on to ferry visitors from the car parks to the actual show area. As we arrived at the show the rain had a temporary ceasefire so we used this opportunity to have a walk around outside. Here too were small show gardens. These are shown in the photo album in order of achievement. 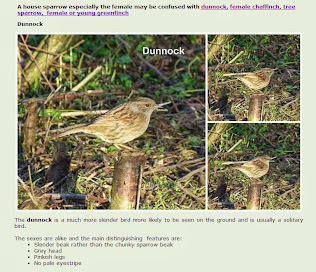 Click on the album to view the larger size photos. Our boots proved invaluable again as it was very muddy all around the show gardens. The rain held off long enough for us to have a look around and then we made it into the flower marquee to view the indoor displays. I'm afraid some of the colour in the photographs and focus isn't as good as I would have liked as the indoor marquees were quite dark and gloomy. We didn't actually buy anything - it's always disappointing that the plants on display are often not available to buy - but we did take the names of a couple of nurseries that we will most probably visit. We also had the chance to check on a couple of details about he summerhouse that we have on order, as one just like it (except for the colour) was on display. Now Martyn feels fairly confident that it will fit in the allocated spot! Martyn also filmed some video of the show which has been posted here. PS Tomorrow is the last day for entering the herb competition and so far no-one has managed to correctly identify all the herbs! If you are a regular reader you may remember that this year I have been renovating a border situated under one of our crab apple trees. This is the border that initially needed a focal point and ended up being totally dug up and now replanted with perennial plants and a couple of new shrubs. I've now named this border the Wiilow Screen Border as we have two crab apple trees and this way I can differentiate the two flower borders. The border is still in its infancy so I will have to wait until summer to see how things are shaping up but at the moment the crab apple - Malus Profusion - is at its peak. The very best view of the flowery canopy is from a bedroom window. I couldn't resist a quick snap even though it was pouring down outside which has affected the focus somewhat. It's always tricky getting a photo between the diamond leading on the windows at the best of times. If you want to see more photos of how the border under the crab apple is progressing I have charted the progress on my website here. I'll be adding more photos as the plants grow. At the risk of becoming boring I'm going to write yet another post about fruit! At the moment the fruit beds are the areas on the plot that fill me with hope! At least being permanent plants they haven't suffered too much from our enforced plot absence. The fruit will actually enjoy the rain - that is as long as it doesn't reduce bee activity. This is probably one of the best views of our plot at the moment. It's just a pity that we can't sit out with a coffee and enjoy it! 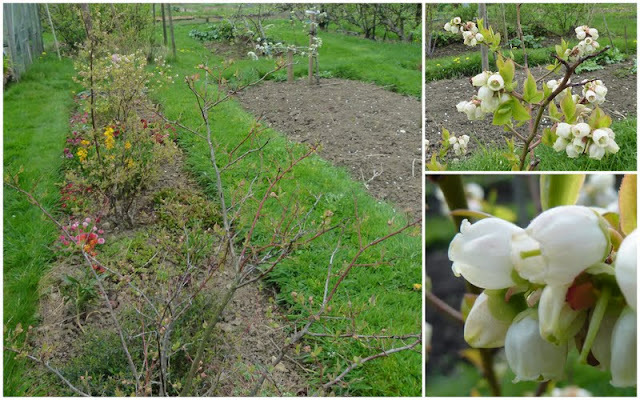 I hope the pear blossom has been productive. The apple blossom is on the point of putting on a show. Even the early strawberry plants are trying to ignore the awful weather with the odd valiant flower. 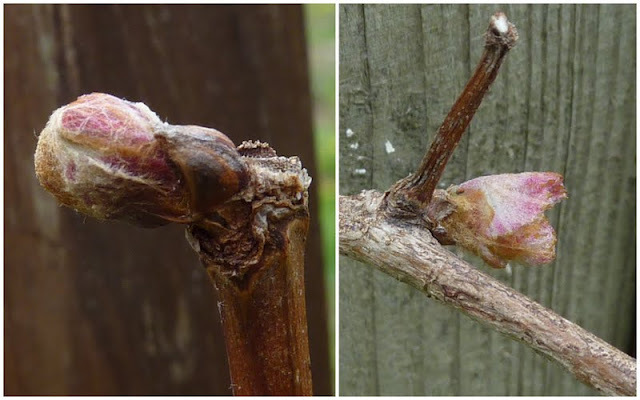 Our raspberry Glencoe - the one with purple fruits - is in bud. If you look carefully at the first photo of this post you may be able to make out Glencoe's arching canes in the middle of the bed immediately behind the pear trees. Here's a closer view. 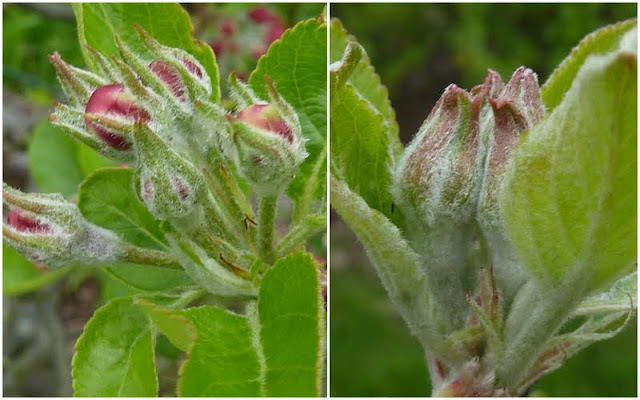 Finally the quince has produced lots of flower buds so we are hoping for a good crop - we developed quite a taste for quince after we picked our first fruits last year. I bet you've noticed all the dandelions in these photos which is a sign that we also need some dry weather so the grass can be mown again. Second visit in two days - WOW! Despite a poor forecast, the weather on Saturady allowed us to put in another good afternoon's work on the plot. Unusually for us, Martyn and I both spent time concentrating on one area of the plot. (We are usually out of sight of one another). Martyn was mainly kept busy tilling the beds so that we could plant out another batch of potatoes and preparing the area that will become our second strawberry patch. My first task was to weed the existing strawberry bed which I had earmarked as a big priority after Friday's plot visit. I want to try to keep up with weeding this bed so that I don't end up with strawberry plants smothered by weeds as happened in the old beds. After weeding I sprinkled blood, fish and bone around the plants and gave the whole area a really good hoe. The bed now looks presentable! As you can see most of the plants are growing well and so I am left with lots of new plants in the cold frame. These were taken from last year's runners and were intended to take the place of any winter casualities. Typically with a back-up plan in place winter wasn't as destructive as it could have been. The solution will be to plant up another bed. Martyn has tilled this bed in readiness. The plants in the above photo are alpine strawberries. I haven't decided whether to move these or not but I doubt the bed will hold all the waiting plants unless I put them much nearer together than is ideal. This bed is on the edge of our plot - the other neat beds belong to our plot neighbours - Jo and Pat. You may remember that a couple of the fruit beds were also becoming very weedy and so I had tidied those up too and also added some fish, blood and bone fertiliser. These beds are on either side of the strawberry bed. You can see the edges where my new lavender cuttings will be planted - I may need to take more! We also managed to plant more potatoes so almost all the potatoes are underground. We have certainly speeded up our potato planting since we rejected the trench method. Now it's a case of just digging a hole as deep as possible with a trowel and popping the tuber in. The soil is earthed up over the newly planted row. Our method is described on this page of my website. 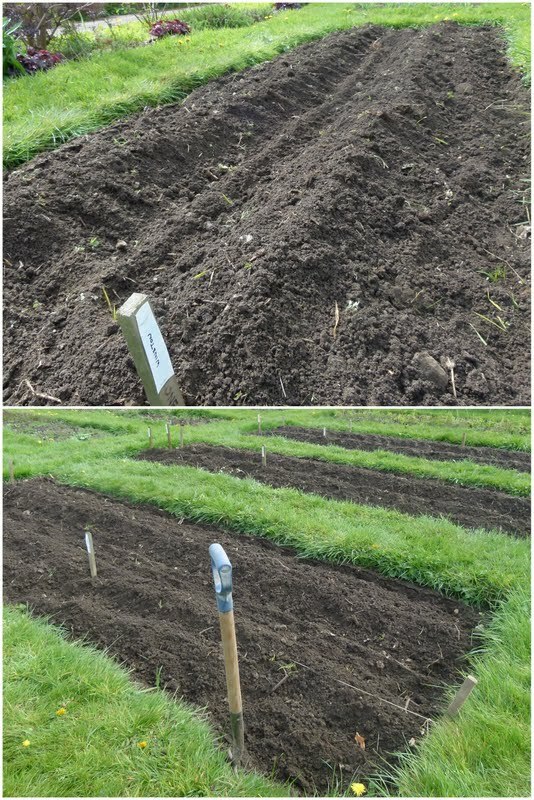 Martyn has posted a photo on his blog here and written more about the varieties of potatoes planted. He has also 'very kindly' showcased the photo that I took of our most weedy area. Well maybe not the most weedy as other areas are just as bad - if not worse! Happy Days! Don't forget to enter the Herb and Spice Seed book competition. Just to encourage you it could well be that no-one has so far correctly identified every herb so don't put off entering because you can't answer ALL the questions. You could still win! We managed to get there! Friday's weather forecast promised that the rain would ease up and it did. We actually managed a fairly full afternoon on the plot. Part of me wished that we hadn't made it as to see the amount of weed growth courtesy of all this wet weather was a bit depressing. We were getting on so well and had only a couple of beds to clear and then the bad weather descended and has managed to create conditions which have allowed nature to undo all our work. I didn't take a photo of all the weeds as that woud have been rubbing salt into the wound but suffice to say the weeds including self sown poppies are flourishing. If we left all the poppies in situ we would rival the poppy fields of the Middle East. Unfortunately we just couldn't spare the time to do any weeding as there was some urgent planting that needed doing. The broad beans that have been desperately in need of planting out - they were nearly starting to produce flowers - have been planted. The poor things are taller that they would usually be when planted out. I've tried to set them in a little deeper and will now have to hope that we don't get any strong winds before they gain a bit of strength. We didn't even have time to tidy up the edges of the beds as we just wanted to spend as much time as possible planting. As well as the broad beans we managed to plant about half of the potatoes. Details of which varieties are available in the sowing and planting for April list. All in all we were fairly satisfied with the afternoon's work but oh dear those weeds! It's a wonder I didn't have nightmares! 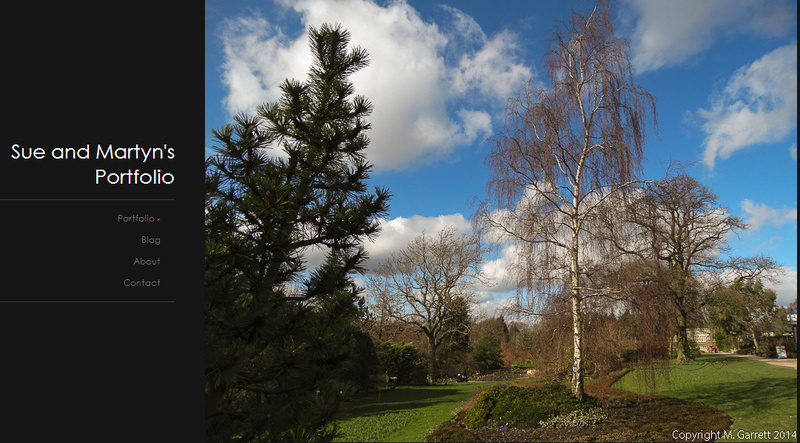 We're hoping for more fine weather as there is still so much more to do! Recently I was entered into a prize draw by Carrie the author of Grow Our Own. The draw was to celebrate Carrie and husband Andrew's allotment's fourth birthday. All I had to do was to make a comment on one of Carrie's posts which I am happy to do regularly anyway and would have done so even without the chance of winning a prize. Anyway as you will have guessed from the title of the post I was lucky enough to be first out of the hat and therefore the lucky recipient of the secret prize and the resulting excitement of unwrapping the mystery package that arrived on Wednesday. The book Tips from the Old Gardeners - this is all about garden folklore and the scientific truth behind many of the 'Old Wive's Tales' passed down over the centuries by our gardening ancestors. (I'll enjoy curling up and having a good read of that - just right for the awful wet days we have been suffering). Carrie is also a skilled photographer and she included three of her photographs in the package. Two are in the form of cards which I have no intention of sending to anyone and the third is a large postcard of the view of the castle at Carrickfergus where Carrie lives (Carrickfergus that is and not the castle!). Thank you Carrie for a lovely gift! PS - For some reason Google Chrome has decided it doesn't like my computer. I've uninstalled and reinstalled 'til I'm blue in the face, I've emptied caches, I've run various utilities, all to no avail. Google Chrome refuses to co-operate. It won't even open! This has forced me to use Internet Explorer to create my blog and view others. Very unstaisfactory - I hope you aren't getting the sorrt of weird looking pages on my blog that I am getting when using IE to view some of the ones that I visit! ... but could it now stop for a while please? But we need a break so we can actually manage to plant something on our forsaken plot! Snakeshead fritillaries have featured on a few of my favourite blogs recently. 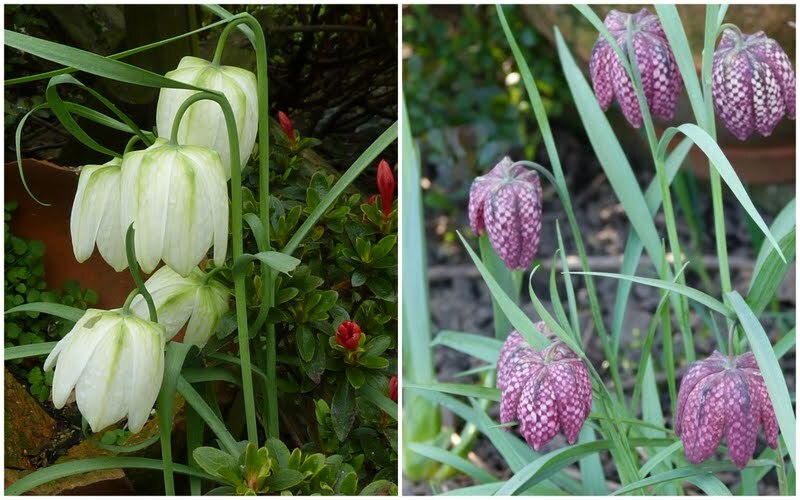 I bought a snakeshead fritillary over four years ago in fact it turned out to be a good buy as when it/they flowered I ended up with two different plants one white and one chequered. The fritillaries are planted by what I call the puddle - it's a very small fibreglass pond, literally more of a puddle. To call it a pond would be deceptive as, although it has some plants in, it was really originally meant to provided birds with an additional water supply. It really needs sorting out as there is hardly any room for water - in fact if you didn't know what it was you wouldn't guess there was water there! 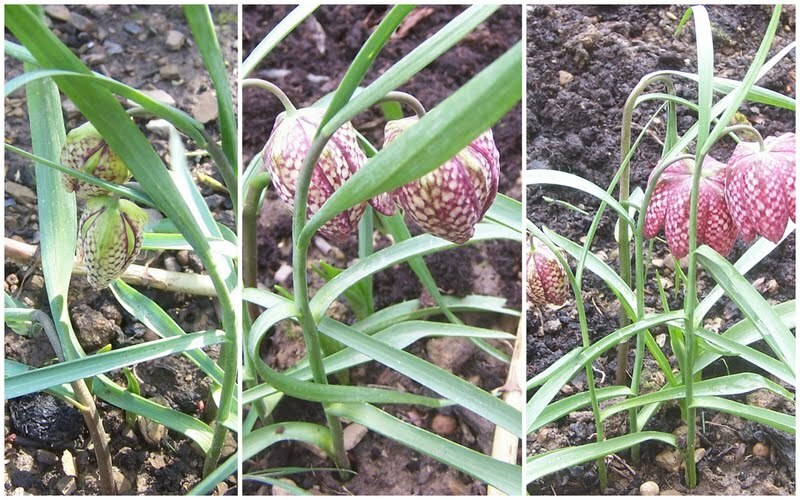 Anyway I guess the splashing must provide sufficient moisture to keep the fritillaries happy. Each year the flower heads produce masses of seeds so I have always expected it to produce lots of babies but although the clumps have grown a little they don't appear to have self sown freely. As a result I tried to see if I could help matters along a little and sprinkled some seed into a seed tray. I think this was in 2010. Nothing happened for quite a while and then - I think it was around February of the following year - some seedlings started to appear. The whole process has taken so long that I am ashamed to say that I haven't really kept track - to be honest I'd given up on them! I do remember pricking some seedlings out into pots and popping them in a tray behind the greenhouse where I more or less forgot about them. Not that's not quite accurate - I DID forget about them! Until that is last week when I was surprised to find some new shoots in sodden compost, some being smothered with weeds. Far worse than than in the following photo. I probably should have just left them but the weed roots were a thick mass and taking up most of the space in the pot so I decided to risk tidying them up and putting them in fresh compost. Each blade of grass-like growth had a tiny white baby bulb which you may be able to just make out. I decided to pop them back in the tray behind the greenhouse as they seemed to quite like the soggy conditions there. Time will tell whether I've done the right thing but any new plants will be a bonus. After all in many ways gardening is a bit of a lottery isn't it? The bees will thank me! I took lots of cuttings last year which have come through the winter with varying amounts of success. The salvia cuttings didn't survive in the cold greenhouse nor has the main plant in the front garden. I should have brought one inside but I forgot! The lavender cuttings though have been really successful. They were obviously growing and so I decided to pot them into individual pots. It is fairly easy to tell which of the cuttings have rooted. The rooted cuttings lose the greyish colouring as well even before they put on new growth. The successful cuttings had developed a really good root system. These were potted up individually into small pots with any pieces that hadn't formed any of much root being popped back into gritty compost to give them a second chance. I've ended up with about 20 small plants - the ones that had developed some fairly long growth have been trimmed to encourage the plants to grow bushy. Never to miss a chance I have potted the trimmings as cutting although I.m not convinced that they will grow. I want to use the plants to complete the edging around a couple of the fruit beds on the plot as only two sides of each bed are planted with lavender at present. I'm not sure that 20 plants with be enough so may have to repeat the process next year. Each tear the edging is clipped back to keep it from becoming drawn and straggly. Its just a case of going other it with shears taking care not to cut back to old leafless wood. The edging looks and smells lovely when it is in full flower and the bees and butterflies love it! 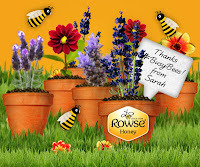 The idea is for us to write a thank you note to the bees on their Facebook page, (Rowse's page not the bees that is!) as a result they’ll plant a lavender plant with your message attached and send you a photo so you can see! So why lavender? 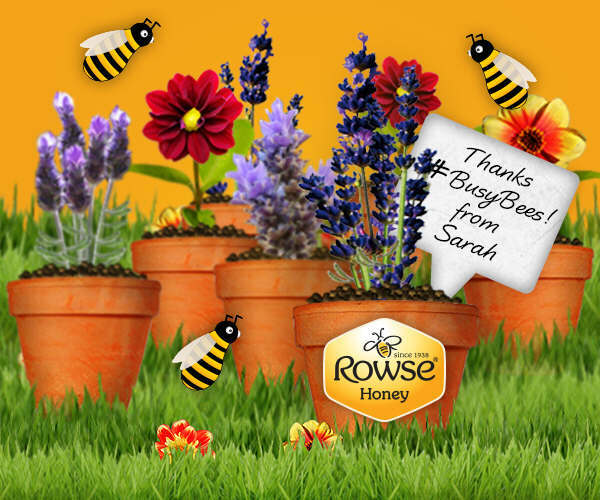 A couple of years ago Rowse donated £100,000 to a honeybee research project, which discovered that bees love lavender most of all. 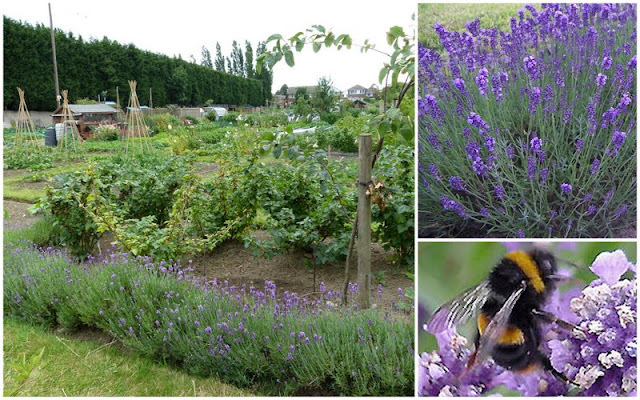 If the research is correct then the bees on our allotment plot will be drunk with joy! PS Don't forget to enter the herb competition! My last post focused on the fruit blossom on the plot but we have other fruit too. It may not put on such a beautiful display of flowers but it still produces delicious fruit. 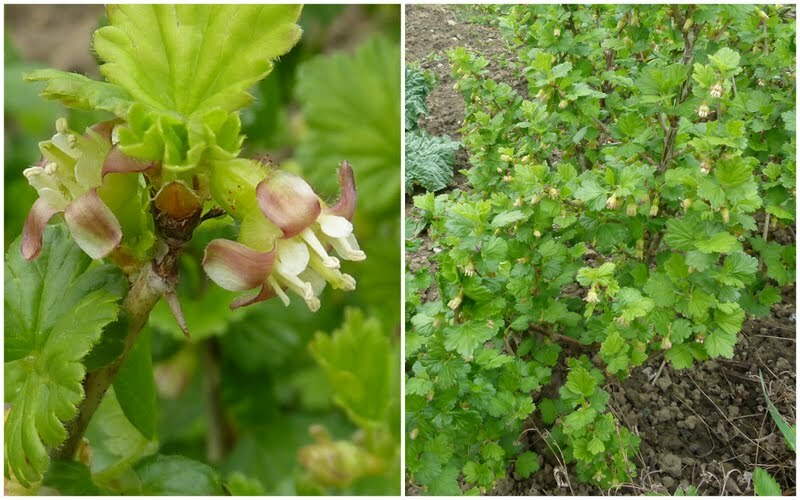 The currants and gooseberries have much more understated flowers although the bees seem to love them. The black and whitecurrants are always slow to the party. We have several varieties of blackcurrants. 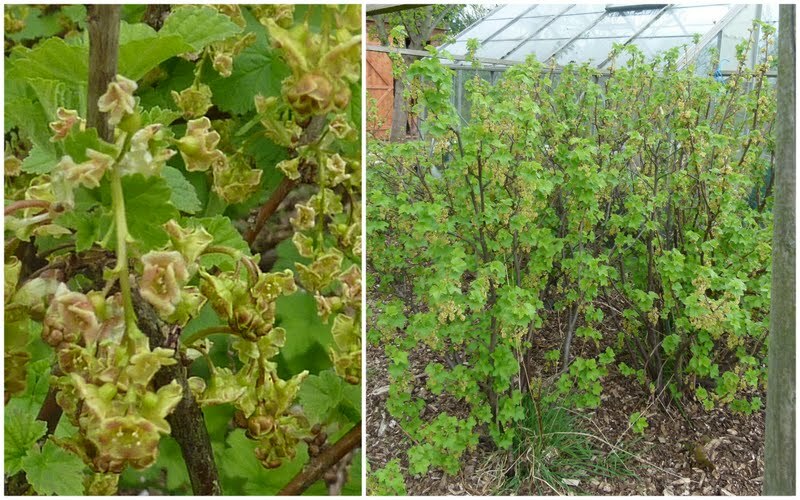 The earliest are just beginning to leaf up but the later varieties and the whitecurrants have only leaf buds. Oh dear - there are those weeds again! The redcurrants - an unknown variety that we inherited - are more advanced and are sporting strands of flowers. Not as showy as cherry blossom but it does the job! 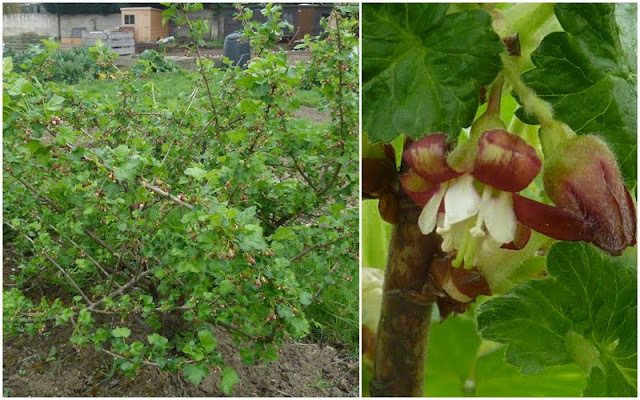 The jostaberry is a cross between a blackcurrant and gooseberry. We have ended up with several dotted about which is what happens when you prune something and just stick the prunings in compost to 'see what happens'. This plant has the flowering habit of a gooseberry and is full of flower. The bush grows much bigger than a gooseberry bush and needs pruning to keep it to a manageable size. The strawberry plants all seem to have made it through the winter although one variety Marshmarvel seems to have been hit more than the other varieties - Marshmello, Amelia and Flamenco. The Marshmarvel plants were knocked well back during the dry summer and are only just producing a few new leaves - this is the earliest variety too! Marshmarvel is the variety nearest to you in the photo. The alpine strawberries are ahead of the game and producing a few flowers. Although most of the flowers have the centres blackened by frost, you can't fault the plants for effort. The alpine strawberries now need a tidy up. The oldest plants (four year olds) will be dug up and new plants grown from seed this year. Alpine strawberries like other strawberry plants tend to wear themselves out and benefit from successional planting. You do need to have lots of plants to harvest a useful amount of berries. We use them as border plants in fruit beds. Unlike the kiwi - Issai - in the greenhouse, the two kiwis on the plot are just beginning to unfurl their leaves. These often end up being frosted but undeterred the vines usually send out more leaves to compensate. 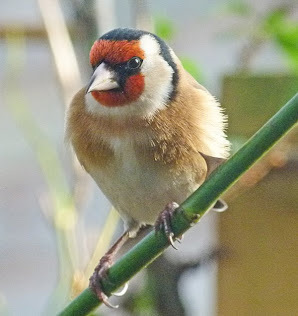 Unfortunately up to now, although the female vine has produced plenty of flower, the male has been very slow to get his act together and so we haven't as yet managed any fruit! Even though it hasn't yet fruited I love the felty leaves! Another fruit on the plot that is nowhere near as far on as it's cousin in the garden greenhouse is the grape. We have two vines - Madeline Sylvaner & Boskoop Glory planted outdoors more as an experiment than anything else - we did have fruit on one last year but the grapes were tiny and never ripened - there again last summer was very poor so who knows. The Boskoop Glory is planted to grow up the shed and maybe benefit from some of the warmth - the shed gets really warm when the sun is out. At the moment it has tightly closed buds - and who can blame it? To quickly round off as this is another long post - the blackberries are concentrating on producing leaves. 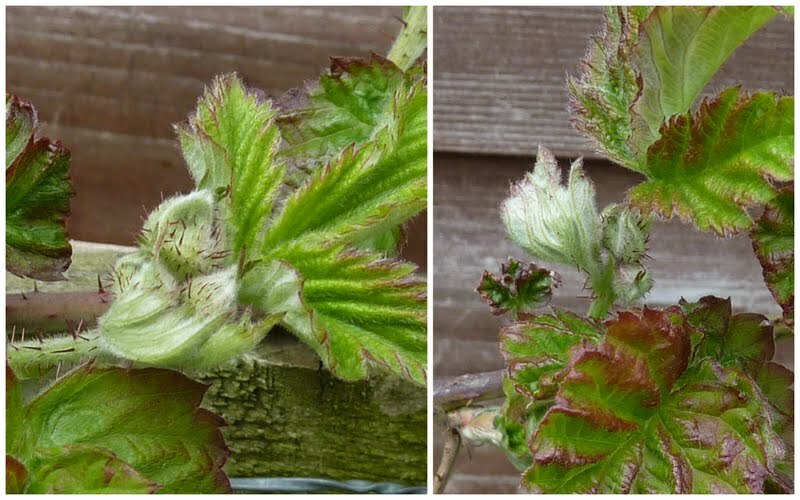 I forgot to take a photo of the Glencoe raspberry but it is leafing up - you'll just have to take my word for it. As for the Japanese Wineberry - the top growth looks very dry but it seems to be producing new shoots from the base. I don't know whether this is usual - anyone any ideas? PS - I keep a full diary on my website so I've popped a tab link at the top of the blog to the current month's diary page along with current month's sowing and harvesting. If I put everything on my blog it would become just a list which would bore the socks off you so the links are there if you are interested! 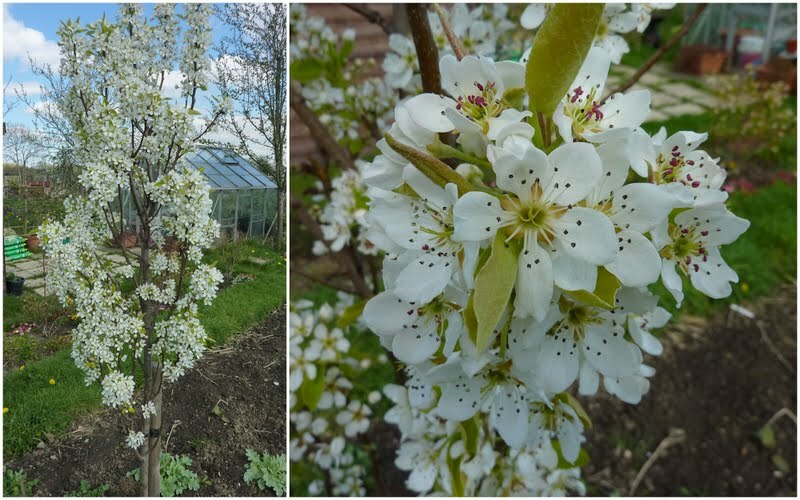 Fruity News - Blossoming on the plot! 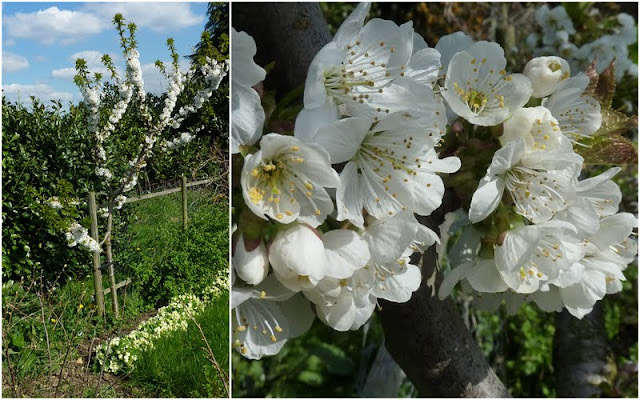 The blossom of the plot is beautiful at the moment - I just hope that much of it converts to fruit. One fruit that I really really look forward to is the cherry. The cherry tree - Summer Sun is loaded with blossom. It develops up the branches of the tree like a sleeve. The very ends of the branches are devoid of flower so I'm guessing that flowers don't form on new wood - this should mean that we can snip off the ends of the branches - if we dare - this has to be done during the growing season to avoid disease. We don't want the tree to grow too high as we need to cover it with netting once the fruits start to turn. As the birds love cherries as much as we do failure to do this will result in disappointment! If only every single flower developed into a fruit! We have three fairly new pear trees. The one that is in full flower is Delsanne. This is fortunately partially self fertile but will set more fruit if one of the other pears will oblige and help with pollination. It's immediate neighbour Red William's has flowers still just in bud but a few have opened - they look remarkably like apple blossom buds. And the third Invincible is somewhere between the two others having more flowers open than the Williams but still having buds too. Hopefully this variety will bridge the gap and cross pollinate with both of the two other trees. That's what must have happened last year as we had fruit on all three trees. One of the greengages - Reine Claude - has more blossom than the Mannings gage too. It would suit us if the varieties of gages and plums decide to produce good crops in different years as this way we can avoid one year of plenty and the next of only a few fruits. The most the apple trees are managing are some tightly closed buds. These are the early varieties others have no sign of buds yet. Sensible fruit! As for the quince - so far only unfurling leaves. I hope this has fruit again this year as we really developed a taste for quince last year in spite of only having about eight fruits. Don't look too closely at the photo as the bed needs weeding! Not a tree but I am including the blueberries in this post. We have four but can't remember the varieties. I do know that they all flower at a slightly different time. The first one is flowering at the moment. I'm afraid the quality of some of these photos is a bit 'off' but they were taken in the gloom so hopefully we'll do better next time! The blossom is beautiful but I can't wait to see how much fruit sets! Back to all things gardening!